It's easy to win a few hands at poker. Sooner or later, you are bound to get an unbeatable hand that will result in a winner, but the skill, it seems, is to master this art on a regular basis. Several poker moves can be mastered however, and with this simple guide, you too can earn some quick chips in scintillating fashion regardless of whether it's in the online casinos, or down on the real casino floors. As frequent readers of this site will know, going all-in is a favourites strategy of ours. But, there are plenty of examples of where the bold move has backfired, so it is essential to time your plot carefully. If you check/call on the opening bets it makes you seem interested, yet it also puts you in the back seat, shall we say. Opting to wait for a good card - or the chance to bluff a good card - with a high stakes raise or an all-in call can often put your competitors off matching the bet, leaving you to reap the rewards of your bold stake! This tactic is similar to that of the 'double-barrelling' technique. This move is particularly effective against players who have descended into check-call mode - which is where they have the cards, but they are simply waiting on you to make the first move. 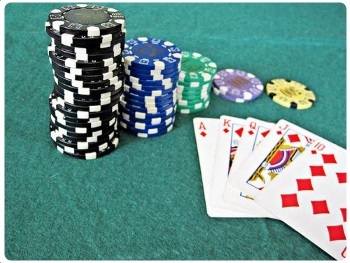 While you may have a good hand and you may want to seek the best possible pay-out by staking just the right amount of chips for your opponent to remain interested, betting big is again the answer. It will scare your opponent and likely make him consider what hand you may have - especially if an open hand such as a flush or a straight is possible. The doubt the overbet will cause is enough to put many people off opting in. We have all come across the players who like to dictate the play of a poker table and stake regardless of what cards come out in the flop. The strategy usually works for a while as well, but seeing as it has become such a common enemy in today's poker, it is time to strike back. Opt in on several hands with the player, regardless of whether you have a good chance of winning. This will keep the player interested and less the confident of when exactly you have a good hand. Then, when you finally do have a good hand, stay cool, bet bigger than usual - but not too much - and make sure to keep the opposition interested. Pausing to think, consider and even breathe can often give your opponents the time to work out what kind of hand you may have, whereas fast - but not impulsive - moves can throw them off guard and can have them questioning every move that follows. Does my opponent genuinely have a good hand? It seems the flop cards are the ones my opponent wanted, did I want them too? Is this just a quick-fire bluff? These are just some of the doubts you can put into your rival's mind with speedy decisions.